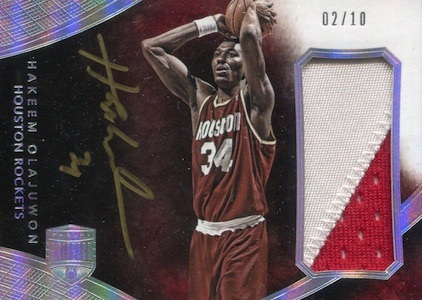 Promising a "basketball experience unlike anything you've ever seen," the big draw of the late-season product is the valuable metal pieces embedded in the cards. 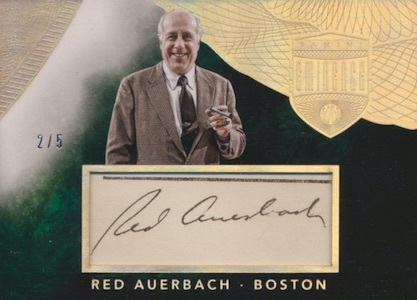 There are also many on-card autographs for top NBA names and cut signatures from a wide variety of subjects, including baseball greats. 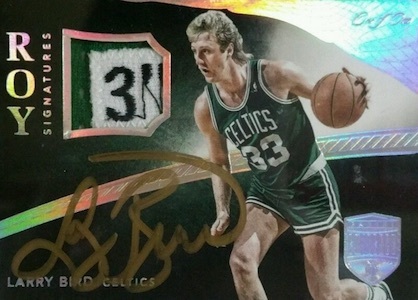 Autographed Championship Tag Memorabilia cards make their debut. 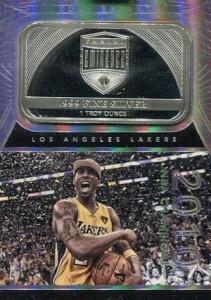 Offering seven to ten cards per box, every card is either a Precious Metal, Autograph, or Autographed Memorabilia card. While not much else is known at this point, every card in the release is numbered to ten copies or less. Panini teased the release in a short video posted on their blog. 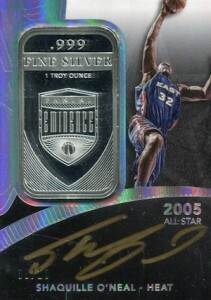 Tracy Mcgrady Eminence Gilded Graphs GOLD Foil Blue TMAC Auto Jersey # 1 5! 9 cards. 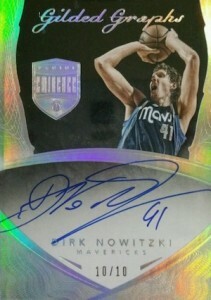 #/10 or as noted. I don’t care for “pre-release” product reviews as its completely unreasonable to do so without the product in-hand. However, Panini’s latest foray into the deepest, darkest pockets of collecting’s “whale collectors” demands comment. Panini …and Topps, for that matter, are once again releasing an absurd number of products per sport, with those products offering no relationship to one another. Further compounding the Cardboard Confusion, however, is the design and release of products with ever escalating MSRPs. I thought products such as Dynasty, National Treasures and Flawless were ridiculously priced, until I caught wind of this product’s price point. Ridiculous! Trading Card companies will continue to plumb our pockets until such time as collectors push back. 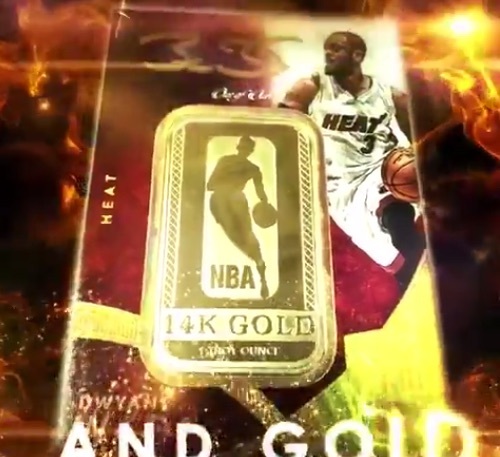 Gold, platinum, rubies, diamonds… SERIOUSLY? I’m waiting for “DNA” cards, where collectors can “truly own the game!” Wait….what if Topps just scotch-tapes a real player to a card! Will the breakers finally stop pushing Panini products?! Doubt it. Lets see, at the reported price, how much is that by the player…hmmm…still too much! Wake up PEOPLE! Don’t care if Panini places gold or platinum in the cards, you still don’t have the 2 autographs that all basketball fans want. 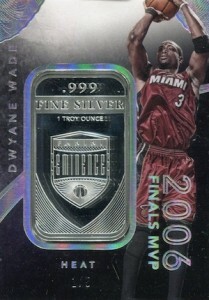 Hope basketball collectors just ignore the product. So happy Panini is out of hockey. Great names, unique product, even Elvis, but didn’t a guy name Michael Jordan play basketball??? I know he played baseball, but how could he be overlooked for this product? 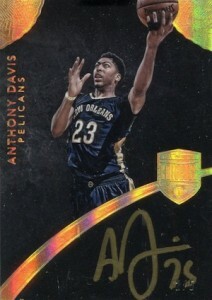 Does he have a contract with a certain company that does not allow him in Panini? 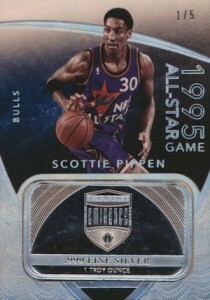 Michael Jordan is exclusive to Upper Deck. He is not in any Panini products. I know Flawless is overpriced but this “product” takes it to a whole new level. Panini could charge whatever they want, make whatever they want but they will NEVER come close to or surpass the quality that was Exquisite. Just because the purchase price is “high-end” doesn’t automatically make the cards high-end, IMO. And the only thing “high-end” about this UGLY product is it’s price point! Beauty is in the eye of the beholder. In my humble opinion – these are some of the most appealing cards released by any manufacturer. I’ll buy them alone for that fact and that they are unique with regards to Hugh end patches and autos and encapsulation. In the end, Panini, Topps etc….are businesses and need to make money. If they can generate high profit margin on these sets and people buy em – great! If not – them they go away but the consumer ultimately has no gun to there head to buy anything. I bought a case of LEAF Unopened 2016-17 and walla won one the Eminence box!!!! My box had 10 cards.Iverson auto base/Shaq Olympic auto patch/Kareem silver oz.auto/Pippen jumboP auto 1/1 /DRobison AutoP /HakeemO AutoP /JWest Silver oz of 5/GPayton USA Olypic AP / TParker AutoP /CPaul Silve OzAuto. The level of anticipation to get and break open the case was immensely awesome and will never forget. 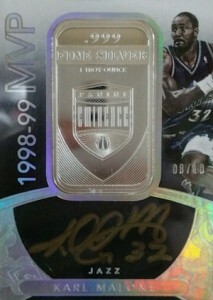 These cards re the top of the line for a collector! The price is way high, however, the way I got mine was a dream come true. i would not spend 6,000$ bucks on these, but I felt like a million bucks winning a box and opening one!